While you are in an asana practice, listen to your breath and tune into your mantra. What sound do you hear while breathing? Does it feel good? Focus on it. Breathe and BE with it. This is yoga. This is union of the senses. This is union of mind and body. Breathe and notice the subtle shifts. Feel your prana or chi flow through each movement. Be with each moment and each breath. Subtle shifts occur when we withdraw the senses and feel the power of mountain pose. Feel your root as you ground into the earth. As you flow through the asana or move with the breath, begin to meditate on your mantra. Begin to trance out into a sound zone that flows with your life force. Make your breath and mantra one. Take this practice and live your life fully. I promise you will like it. There seems to be a trend in the western culture with yoga for fitness. As much as I love to exercise and move my body I don’t totally flow with the idea of yoga for fitness. However, I know it works and I too often turn to yoga as my daily workout. I know, I am totally contradicting myself, but maybe that’s the point. To awaken the western culture that there is a balance between yoga as a physical workout and yoga as a spiritual practice. Yoga in the western culture has grown tremendously in the last decade. Over 14.5 million Americans strap a yoga mat bag onto their arm and practice this beautiful ancient, flowing asana art. Many lives are transforming all because of the power behind asana. Hearts are awakening and people are rediscovering their true inner light all due to the simple act of moving from one posture to the next. People are practicing in gyms, studios and now with the internet they are able to take online classes. There is a number of growing resources available for this ancient art. It’s bringing the world back to balance. So whether we practice for fitness or we practice for mind/body/spirit connection, we are all eventually being guided to that ONE place, which is ONENESS. I recently witnessed the power of this practice in one of my classes that I taught at a fitness club. Twice a week, I enter a 2 plus million dollar fitness club where I am surrounded by bright lights, big muscles, lots of weight machines and loud pop music. The place is filled with all types of people and all types of bodies. Sometimes I get butterflies in my stomach because I worry that my approach to yoga is to spiritual for an environment like this. Sometimes my ego tells me I should be teaching only in a studio or teaching private lessons. However, I always seem to learn something new and beautiful about not only myself as a teacher, but all the shining beings who come to my classes there. They become my teachers because I open myself up to what they can potentially teach me. On some day’s I have 20 students and on others I have 4. It all depends on the weather. From that day on, I have allowed myself to open up and not sweat when someone requests a type of class. On another note, I have seen my students open up so much that they too are open to trying different sequences and styles. They just let me do my thing as I so subtly kick their asana’s every week. I have found that since we have opened up to each other and allowed the balance between fitness and spirituality merge, they approach me at the end and thank me for a great class. My heart filled up the other night after noticing how the group had subtly transformed in the last few weeks. I usually start the class in a seated position, where they sit and listen to their own breath. On that evening of subtle awakening, I changed it up a bit. Instead of starting them out sitting, I had them sit before savasana. After a few minutes I told them they could now lay back in savasana. I sat and waited to see if anyone was going into savasana. No one moved. Wow! So I sat with them and guided them towards their inner light. I guided them towards finding their own mantra and what it means to focus on a sacred sound. A couple of minutes later, I mentioned savasana and told them at anytime they could lay down on their backs. Still no movement. Just complete silence and peace continued to fill the room. Wow! Finally, I had them awaken from their meditation because it was time to end class. As I closed the class with a divine namaste, they awoke and bowed. Everyone smiled as peace filled their hearts. Everyone was calm. Everyone felt the power of their own yoga. As a group we had transformed. So there it is. The balance between approaching yoga as a fitness routine and yoga as spirituality. I honestly feel that with the right teacher, the gym is where people sometimes feel the safest in starting their yoga practice. I don’t think everyone feels it’s the safest, but I feel it’s a start. The western culture needs stimulation on a physical level and peace on a mental level. This is a place where yoga has the power to balance all of that. In celebration of Earth Day coming up, I focused my kids yoga class on this particular theme. I wanted to make it lively and vibrant rather than boring them with dry ideas. There are great resources out there on how to educate children about Earth Day. I wanted to focus on making them interested in the subject by being as creative as possible. I researched different ideas and used some of my ideas from last years Earth Day. I wanted to teach something that 4 yr olds could grasp and that 7 yr olds could appreciate. So through my research, I found a really cool class idea on Google. The theme was based on using a parachute and telling the story of going on a nature hike. As you continue to read below, you will see how the story goes. So, I followed my class plan and integrated my own ideas. Circle Time: I asked the class to raise their hand and tell me if they knew what Earth Day was. Honestly, I didn’t expect many of them to know, especially the 4 year olds. The 7 year olds all knew what it is and had great things to say. 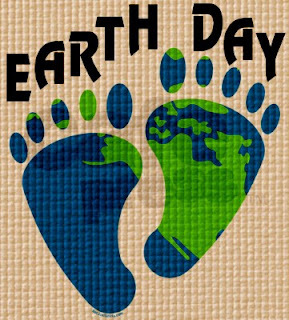 ‘Earth Day is a day to take care of the earth. On Earth Day I am not going to take a shower!’ to ‘Earth Day is when we recycle.’ Great responses! I made sure I explained that we should care for the earth EVERYDAY! Tick Tock Yoga Clock Song: Kids love this song! (Let’s Play Yoga Cd by Karma Kids) It has nothing to do with Earth Day, but it sure does make them happy. Laid the parachute out on the floor as the kids gathered around it. Going on a nature hike to see what we can see. Up, up, up the hill…we see lots of trees. Going on a nature hike through soggy bog. Hop, hop, hopping high with our friend the frog. Going on a nature hike to spy what we can spy. Down, down, down the hill…we find butterflies. Going on a nature hike across the flowing water. Row, row, row the boat and we will get much farther. Going on a nature hike to hear what we can hear. Turn, turn, turn around….a singing bird is near. Going on a nature hike past a creepy cave. Tip, tip, tippy toe so the bear in there behaves. We went on a nature hike and we need a place to rest. Slow, slow, slowing down…on that big rock seems best. After we finished, I put the parachute aside and stayed standing in a circle. The circle represented the earth and we were the trees. We held hands and came into tree pose. We stayed with our hands held and trusted that we would be supported and taken care of by each other. I then had them go back to their yoga mats as I walked around with a coloring page. The coloring page had an earth with trees standing all around it. They each colored the page and shared crayons. As they colored I read them Todd Parr’s book The Earth Book. This book has vibrant illustrations and fun truthful facts about how to take care of the earth. Kids love it! When we were done they laid quietly in savasana as I explained that the earth was supporting them as they lay there and rest. I explained that when you take care of the earth, the earth takes care of you. and you sit and stare? You stare at a white wall. When you face yourself ? You come to know God.